The Execute T-SQL Statement Task in SSIS is used to run only the T-SQL statements. In this article, we are going to create the New table and send the following data into that newly created table. In this example, we are going to explain the functionality of the Execute T-SQL Statement Task in SSIS. For this demonstration, we will create the New table and send the following data into that newly created table. Connection: Please specify the Server instance name and credentials to log into the SQL Server Database. Execution Time Out: Here you can limit the execution time of a T-SQL query. If the query exceeds this time then task fails. T-SQL Statement: Write the T-SQL statement you want to execute. Select or enter Server Name: By clicking the … button you select or if you know your server name then type it in the text box. 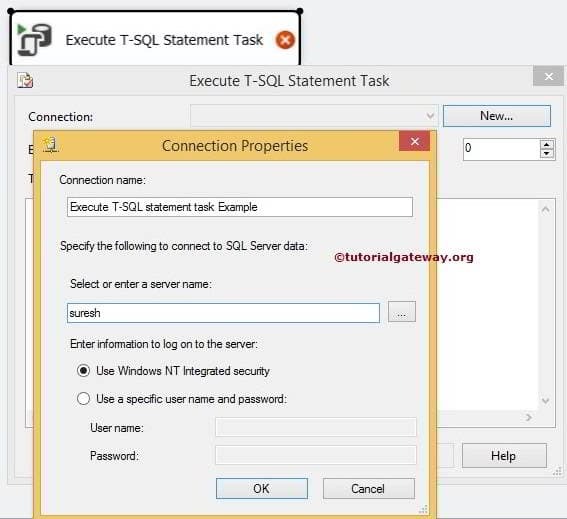 Use Windows integrated security: If you select this option then, Execute T-SQL Statement Task will use Windows Authentication to connect the Microsoft SQL Server. From the above screenshot you can observe that, We are connecting to our own server using windows security. We successfully inserted the selected rows into new table using Execute T-SQL Statement Task in SSIS.